One of the biggest hurdles buyers report facing isn’t their credit score or even the price of a home. Instead, they claim that saving up for the down payment on a Lake Havasu home can be the toughest thing to do. This rings especially true for first-time home buyers. It doesn’t have to be as daunting of a task as you might think. Here are a few simple, easy ways you can start saving for your down payment right now. Yes. The government provides short-term loans to help you buy a Lake Havasu home. The Arizona Housing Finance Authority offers a Home Plus Program for Lake Havasu buyers. This no interest loan acts as a second mortgage when you buy a house. For the first three years of your mortgage, 1/36th of your payment will be applied to the second mortgage loan each month. Loan amounts vary depending on the type of loan you use for your primary mortgage. Income limits, creditworthiness and other requirements must be met first. The next step in your down payment savings plan is to start paying in cash. Groceries, movies, dining out, shopping of any kind. It all should be paid in cash. You’d be surprised how much less you spend when you actually have to hand over cash money instead of a plastic card. It also raises your awareness of how much you do spend on a day-to-day basis. Save all your change from each transaction. At the end of the day, put it in a jar on your dresser. When the jar is full, roll the coins up, take them to the bank, and deposit the total into your savings account. Speaking of savings accounts, now would be a good time to shop around for a savings account that offers better rates. Your current savings account may not be the best. Talk to an account manager at your bank first to see what they pay for their savings accounts. Then, look around at other banks to see what they offer. Some banks provide perks simply for opening a new savings account with them. And, it may be a good idea to keep a completely separate account for your down payment savings. Opening an account up at a different bank than you normally use makes it more difficult to access it for shopping excursions or the like. Another thing you should do to save up for a down payment is to set up automated transfers. Talk to your employer about transferring a specific amount of each paycheck into your down payment savings account. By setting it up automatically, you’ll never have it in your hands and your savings account will grow. Also, transfer any bonuses or raises you to receive into your special savings account. Next, time to reduce your expenses. The easiest places to save are with eating out and coffee runs. Start making more food at home. The money you normally spend on your daily latte or eating out for lunch each day should be transferred into your savings account each week. Then, look at what you spend on cable, internet, and phones. Many companies offer bundles for these services (savings when you use two or more of their services). You could also ditch the landline altogether. Shop around for better rates for your cable/satellite services. Many times, these companies offer special discounts for new customers. Just make sure you won’t incur any charges when you move in the future (after you sell your current home). As a bonus, sell any unused clothing, furniture, appliances, sports equipment, bicycles, etc. The money earned from these sales goes directly into your down payment savings account. Now, this may sound a little weird when talking about saving money, but you might actually want to spend a little. A lower credit score means a lower interest rate. A lower interest rate means less money necessary for your down payment. Talk to your lender about whether this is a feasible option for you first. Finally, many loans allow a portion of the down payment to be in the form of a gift. You must disclose where this gift came from, of course. That means disclosing information about the gift giver, whether that’s grandma, your best friend Steve or a charitable organization. Each type of loan has its own restrictions regarding gifts. Talk to your lender to find out more information. 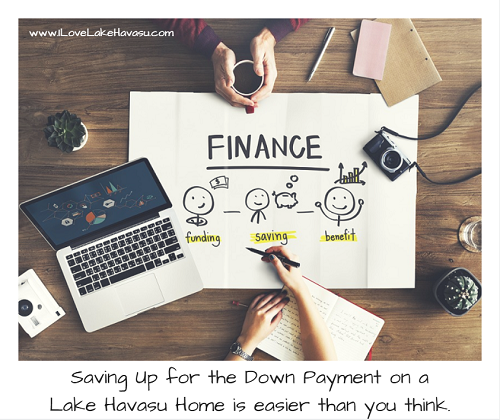 As you can see, there is more than one way to save money for the down payment on a Lake Havasu home. Start saving now by implementing some of these ideas into your daily life. Then, when you’re ready, contact me and I’ll help you locate your next Havasu home.